SIP Trunk Pricing | 8x8, Inc. The demand for Session Initiation Protocol (SIP) trunking continues to rise, which is good for your business as you’ll be able to find a provider that offers competitive rates. But, does your business actually need SIP trunking? SIP trunking is the process of delivering both voice and media over the Internet. 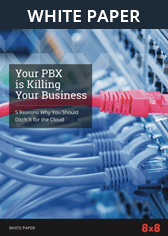 It’s integrated into most Voice over Internet Protocol (VoIP) or Private Branch Exchange (PBX) systems. SIP trunking allows you to deliver a high-quality and reliable digital connection without the need to install expensive hardware or upgrade your phone systems. SIP trunking and VoIP go hand-in-hand. VoIP allows you to have a business phone service that utilizes the Internet instead of your traditional phone service. SIP trunking allows you to scale your existing business phone network without huge costs. With SIP trunking in place, a call will be routed through your VoIP phone system, and it expands the use of your current business phone system while adding useful cloud features. SIP trunking offers you services on an as-needed basis, meaning you can scale your system up or down as you see fit so you're not paying for anything you’re not using. Plus, by combining voice and data, there’s no need to bring in additional physical lines. SIP trunking, IP protocols, and various messaging applications can be brought together into a single communication solution. This makes it easy for your technical team to manage your network while supplying your entire team with an easy to use communication tool. As your business grows, you’ll probably need to add more phone lines. With a VoIP system that supports SIP, you’ll be able to add more lines without an additional cost per call. You’ll be able to scale up your ability to take more calls as your needs arise. How to Find an Affordable SIP Trunk Provider? SIP trunking pricing depends on several factors like the vendor you’re using, any setup fees, the equipment required, along with the monthly service fee. However, keep in mind that if you are switching from a traditional phone system, then you’ll actually be saving your company money. Most vendors will charge an initial setup fee for starting the service. This fee will cover things like your initial consultation, installation, and testing to ensure everything is operable. You may or may not require additional phone lines, it depends upon your needs and existing system. If you do require additional phone lines, you’ll be charged on a per line basis. For SIP trunking to work you’ll need an IP-compatible handset. If you upgraded your system in the past, then your existing phone system might be advanced enough. However, if you’re moving from a traditional phone setup then expect to pay more for compatible handsets. After the initial setup is finished, you’ll have an ongoing monthly service fee, which will be affected by any additional services you’ve chosen to install as well. SIP trunking can be a very valuable addition to your business. If you need a cheap, reliable, and scalable way to improve your existing phone system, then this can be a great investment. Overall, SIP trunk pricing will depend upon the size of your system, handset requirements, along with any additional features you require.